Since the start of the new millennium, sub-Saharan African economies have undergone a dramatic boom. This surge has been marked by rapidly increasing trade and investment on continent — sometimes described as the “new scramble for Africa,” which has seen competition between the U.S., European nations and China. China, however, leads on many fronts, and its sharpening global competition with the U.S. is likewise playing out on the African continent. For the U.S., imperial tensions have been expressed most recently in the growing trade war with China. But China’s rise as a global power has accelerated this rivalry for several years. Beyond a struggle for mere access to resources, imperialism is the competitive drive for control over resources and markets. Africa is a critical component of China’s strategic objectives for economic growth and hegemony. China’s expansion across the continent has been dramatic, from trade to extraction to manufacturing. Chinese companies are responsible for approximately 12 percent of the continent’s industry, at a value of around $500 billion. In 2012, China became Africa’s largest trading partner and U.S.-Africa trade began to decline, with the U.S. making a sharp turn away from African oil imports to domestic production. Jobs created by Chinese foreign direct investment (FDI) in 2016 doubled from the year before and are more than triple the number created by U.S. investment. China’s role on the African continent has been defined by the financing of more than 3,000, largely critical, infrastructure projects…China has extended more than $86 billion in commercial loans to African governments and state-owned entities between 2000 and 2014, an average of about $6 billion a year…As a result, China has become the region’s largest creditor, accounting for 14 percent of sub-Saharan Africa’s total debt stock. China represents approximately half of Africa’s international contractors in construction. TYPICALLY, INFRASTRUCTURE-building by Chinese companies to African states are loans are backed up by oil or mineral revenues, characterized as “oil-for-infrastructure” barter deals with “no strings attached.” In a high-profile 2015 visit to the continent, Premier Xi Jinping pledged a massive $60 billion in investment. These arrangements allow for a rhetorical spin on the part of Chinese dealmakers, namely that African nations have the opportunity to chart an independent course free from the onerous terms of Western multinationals and the international financial institutions (IFIs), the International Monetary Fund (IMF) and the World Bank (WB). The African debt crisis of the 1980s and 1990s was created by the grinding austerity of IFI structural adjustment programs, where loans were accompanied harsh “conditionalities” of privatization, deregulation, slashing national budgets to the bone and imposing loan-shark rates of repayment. Thus, on the heels of the mid-1970s recession, neoliberal policy and structural adjustment set the stage for the recovery of global profitability through trade and investment terms favorable to the West, policies that amounted to a no-holds-barred assault on African working classes and facilitated the current “new scramble” for investment in Africa and its rapid economic growth. Significantly, China was able to take advantage of the very same neoliberal restructuring to fuel its own massive growth, as have other competitors to the West in Africa such as Russia and India. So while the U.S. remains the largest investor on the continent, with approximately $50 billion in investments, policies that have boosted that growth have paradoxically strengthened its competitors as well. The heightened economic involvement on the part of China has raised the stakes for their relations in Africa, both financially and strategically. As with the U.S. — with the Africa Command (AFRICOM) and network of drone bases and training facilities across Africa — China’s military footprint on the continent has likewise expanded, with a new military base and a growing role in UN peacekeeping troops. Beijing shells out $20 million a year to lease the real estate for its base in Djibouti, and has already stationed over 1,000 troops there, with sufficient space for 10 times that number if needed. 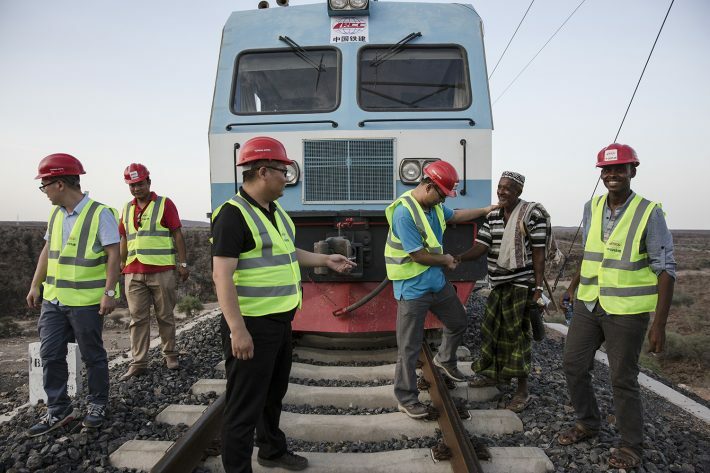 On top of that, the Chinese government has given the host nation loans topping $1.1 billion to upgrade its commercial port, build an additional airport, a railway that stretches to Addis Ababa, and a water pipeline that moves water from Ethiopia. Such warnings reek of hypocrisy. The U.S. is intimately familiar with imposing devastating policies for the sole purpose of creating investor-friendly African economies — and the rest of the Global South — and are always ready to threaten military might as needed to protect its interests. A global drop in commodity prices in 2014-2015 unleashed economic pain on African oil-producing nations whose revenues are heavily reliant on high oil prices. Although average gross domestic product (GDP) for these nations has been forecasted by the World Bank to rise modestly above 3% in 2018 and 2019, future drops in commodity prices promises new rounds of bail-outs by the IFIs, more budget cuts and the harsh medicine of austerity guaranteed to hit hard for working people and the poor. Western institutions are not alone in bearing responsibility for this immiseration. A volatile market and a cash shortfall for oil-producing nations will compel Chinese lenders to call in their own loans. The new scramble for Africa is only fueling imperial rivalries between the world’s major powers, above all between the U.S. and China. While GDPs have soared to new heights in this unprecedented boom, the stark reality is a growing inequality between the continent’s majority and African ruling classes, many of whom are enthusiastic partners with global capital. The rush for profits, economic volatility and militarization across Africa promises only instability, rising exploitation and violence. Social justice activists are fiercely debating the nature of China’s role on the continent, a crucial question confronting the anti-imperialist left as the stakes for the struggle will only grow. First published at Red Pepper. *The views of the above article are those of the author and do not necessarily reflect the views of Africa Speaks 4 Africa or its editorial team.